I feel an infantile delight when I see shiny lights and pretty colors. I sometimes find myself following police cars and ambulances for miles and I have been known to walk into any Spencer's Gifts I come across, lured in by strobe lights, plasma spheres, and the promise of saucy greeting cards for my 40th birthday. That love for flashing lights might explain my abiding love for laser light shows. There is nothing quite so patriotic as spending the evening of a muggy July 4th listening to Lee Greenwood belt out all the hits sure to turn your blood red as green lasers recreate an American flag on the side of a mountain. It's a rare treat, as American as Budweiser or the pain of stepping barefoot on a discarded sparkler, but why limit yourself to just once a year? 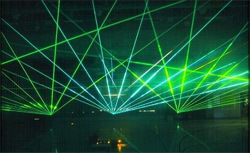 Laser light shows are available for party and event rentals! Once I decided that I needed to hire a laser light show I tracked a company down on the Internet and made an inquiry posing as Sam Samsson. 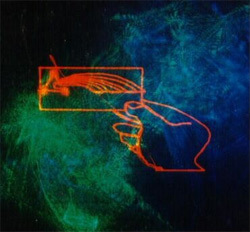 I NEED A LASER SHOW FOR AN EVENT. THIS IS A MAJOR EVENT AND I NEED THE BEST AND MOST POWERFUL LASERS AVAILABLE. PLEASE CONTACT ME WITH DETAILS. Imagine my great pleasure when someone named "Rudy" emailed me back within hours interested in discussing the details. Rudy turned out to have an AIM account and was very eager to discuss my event. My formative email prank became an IM prank. SS_HH: HELLO ARE YOU RUDY FROM THE LASER COMPANY? Rudy: Yeah, are you Sam? Rudy: What can I do for you Sam? SS_HH: YEAH, WANTED TO HIRE SOME LASERS FROM YOUR COMPANY FOR AN EVENT. I EMAILED YOU. I'M SAM SAMSSON. Rudy: Okay, well we have a number of options as I mentioned in my email. What sort of venue will you be holding your event at? Rudy: I mean, square footage, type of structure, that sort of thing. Rudy: Okay, that is fine. We need full electrical access. Is the barn wired? Rudy: That's perfect. What sort of attendance are you expecting? Rudy: I'm sorry to hear that, but are you sure nine people is worth hiring a light show? Rudy: I didn't mean anything by that. That's fine. We would rent to just one person if they wanted us. Rudy: That's great. 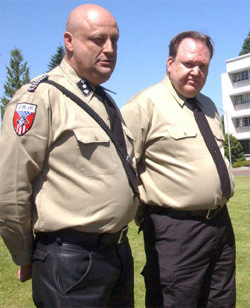 So what is the budget we're looking at for the program? Rudy: It's good to have a starting point. SS_HH: YOUR STARTING POINT IS KISS MY WHITE KEISTER I AINT SEEN YOUR PICTURE I DONT KNOW WHAT SORT OF NOSE YOU GOT. Rudy: We have three packages. Rudy: We have the basic package, which is the basic equipment rental and you handle setup and operation. We have the deluxe package, which is the same gear to rent, but we handle setup and give you an operator for the night. OUr best package is Premium, which is great if you need a custom show. We have our full range of lasers and we handle everything, including custom programming. SS_HH: CRAP HOW MUCH FOR BASIC?!!!!?? SS_HH: YOU TAKE REPRODUCTION MILITARIA AS TRADE? SS_HH: AND I GOTTA WORK IT ALL MYSELF?